Got a Craving for Chocolate Peanut Butter Candy But Don’t Want the Empty Calories? Try these yummy AND healthy treats! These little beauties are not only sweet and decadent tasting, they’re packed with nutrition! I made up a batch for a neighborhood gathering last weekend and didn’t have any leftover to bring home. They’re quick and perfect for hot days since you don’t need to run your oven. In food processor with s-shaped blade, blend all ingredients until they form a sticky dough ball. Spread dough ball evenly in 9″ x 9″ pan. In food processor with s-shaped blade, blend all frosting ingredients until smooth. 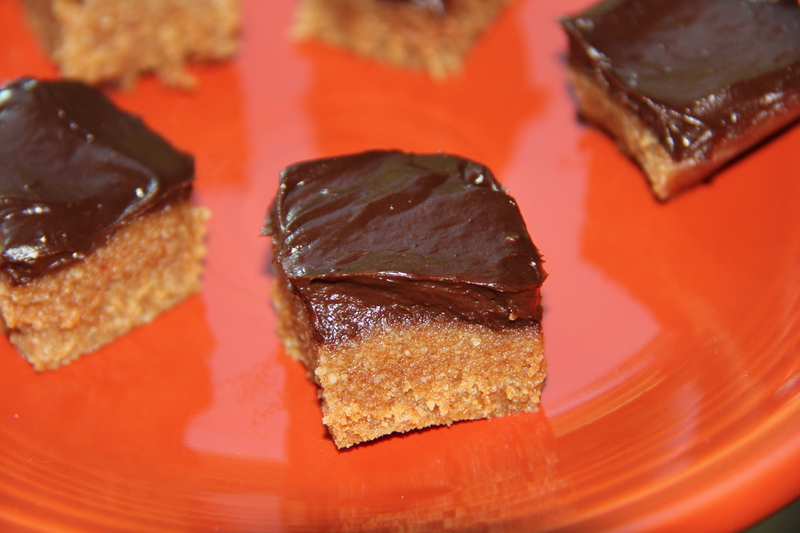 Spread frosting on top of peanut butter bars. Refrigerate for 15 – 30 minutes so they’re easier to work with. Cut into 1″ squares since a small bite is pretty satisfying. Eat right away, or refrigerate to eat later. Makes one 9” x 9” pan. This entry was posted in desserts, Recipes and tagged chocolate, dessert, gluten-free, glutenfreevegan.me, glutenfreeveganme.com, healthy, peanut, raw vegan, sweets, vegan cooking, vegan recipes. Bookmark the permalink. I love this recipe! I just added you to my blog list! just wondering about raw peanuts, a few things come to mind and if you wouldn’t mind educating me- 1. aflotoxin in raw peanuts? 2.raw peanuts…isn’t there some health hazard with that? 3. organic vs conventional? 4. sourcing? This recipe looks delightful, and I hope to hear back from you. thank you. You could use roasted peanuts in the recipe too. Thanks for your comments!